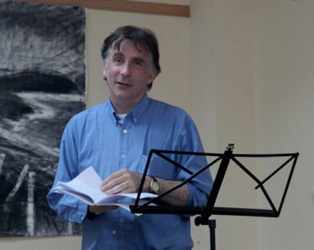 Kevin Higgins facilitates poetry workshops at Galway Arts Centre and teaches creative writing at Galway Technical Institute. He is also Writer-in-Residence at Merlin Park Hospital and the poetry critic of the Galway Advertiser. He was a founding co-editor of The Burning Bush literary magazine and is co-organiser of over the edge literary events in Galway City. His first collection of poems The Boy With No Face was published by Salmon in February 2005 and was short-listed for the 2006 Strong Award. His second collection, Time Gentlemen, Please, was published in March 2008 by Salmon. His work also features in the generation defining anthology Identity Parade – New British and Irish Poets (ed roddy lumsden, Bloodaxe, 2010). Frightening New Furniture, his third collection of poems, was published in 2010 by Salmon Poetry. Kevin has read his work at most of the major literary festivals in ireland and at arts Council and Culture Ireland supported poetry events in Kansas City, USA (2006), Los Angeles, USA (2007), London, UK (2007), New York, USA (2008), Athens, Greece (2008); St. Louis, USA (2008), Chicago, USA (2009), Denver, USA (2010), Washington D.C (2011), Huntington, West Virginia, USA (2011), Geelong, Australia (2011), Canberra, Australia (2011), St. Louis, USA (2013), Boston, USA (2013) & Amherst, Massachusetts (2013). Mentioning The War, a collection of his essays and reviews was published in april 2012 by salmon. it has been described by Clare Daly TD as “a really good and provocative read. it will jolt you; it will certainly touch you; make you laugh; maybe make you snarl a little bit as well, depending on where you come from or what your background is.” Kevin’s poems have been translated into greek, spanish, turkish, italian, Japanese & Portuguese. 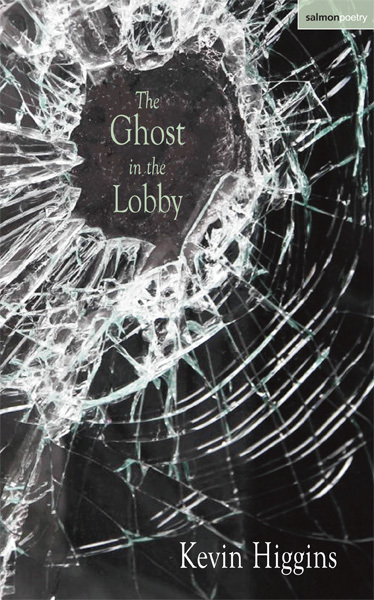 The Ghost In The Lobby is his fourth collection of poetry. Oh, poetry, what crimes are committed in your name! One of the many crosses you have to bear as a socialist is the duty to remain at your post during a protest while poetry is being read. Or at least, “some poetry” is what was promised by the previous holder of the megaphone/microphone. In reality, what you have to stand through is, much more often than not, an over-earnest accumulation of cliché and unconvincing indignation, delivered in a voice equivalent to a sign saying ‘I’m a poet, and don’t I know it’—although that rhyme would be less laboured. It’s at times like these that you really want to know whether it was Plato or Socrates who suggested banishing poets from the republic, because he may have had a point. Because poetry on the left belongs as often as it does to the ‘so bad it’s embarrassing’ category of TV talent show auditions, it comes as a welcome relief to read poetry which is of the left but also good poetry. We’ll come back to the bit about the left, because there is much to come back to, but even socialists should come to poetry with a poetic approach first of all. Do the words work well with, or against, each other? Does it spark recogition, understanding, a new way of looking at something you thought you already knew? At the end of it all, is it a good poem? On all these counts, Kevin Higgins can usually be relied upon to score highly. she pleasures herself by crossing. More extreme responses won’t come marching in jackboots but in the form of a man on the internet, “his mouth full of euphemisms” as he cleverly sets up racist scapegoats (‘Among Aliens’). Conspiracy-mongers get similarly short shrift, like the man who “Doesn’t believe his own birth cert is genuine” in ‘My Inner Conspiracy Theorist’. Nostalgia for the good old days of Stalinism is given a very fair crack of the whip in ‘Ostalgie’ before the occasional “corpses left on the wire at the Wall” intrude at the end. on the other side of the forest. and tilting our heads slightly to the left. it never need prove its existence. Anyone with experience of such organisations will have en¬countered personalities and practices like these. There is a militant irony at play here, with reality heightened, exaggerated, pushed to extremes, but it is eminently recognisable and doesn’t require all that much satirising. There is a fatal contradiction at the heart of a left-wing politics which talks outwardly of change and liberation but inwardly places stifling restrictions on socialist thought and practice. To deny this problem is to exhibit a form of Stockholm syndrome. To accept it as benign or necessary is to masochistically acquiesce in your own political impotence. Higgins’s poetry has a positive role to play in characterising this problem. If a line or two from one of his poems sticks in the head and helps someone reject the conformism alloted to them in such a political scheme, stiffens the resolve of socialists determined to think for themselves, then all is good. However, limitations to his attitude appear repeatedly. ‘Against Togetherness’ dismisses a left-wing misalliance as “devils I’ll make no pact with, / though the country’s begging for change / with a small foam cup”. The play on the word “change” is masterly, but surely the reason not to join with them is precisely because of the state the world is in, not in spite of it, because it demands a genuine radical answer rather than a larger imitation. When, in ‘Leaving The Party’, Higgins is “determined to be / everything you’re not”, his tongue is presumably in cheek, but the party being left is still defining his attitude, albeit inversely. The negation has to be negated itself, if we can speak dialectically for a moment, raised to a positive stance of what we are for, not a merely negative stance of what we’re against. It isn’t enough to criticise sectarianism on the left, even to acerbically and artfully expose it. A better way of doing things should be put forward in its place, and a poet convinced of that could find some expression for it. Of course, poets can and should only write about what they are inspired to write about. Too much politics, not least on the left, is characterised by people repeating things they don’t really believe in, and such self-deception would be found out far too easily in poetry. If Higgins combines his distaste for left-wing hypocrisy with a pessimism towards an alternative, or is understandably waiting for more evidence of its viability, then honesty demands that his poetry reflect that. Party lines, instructions, even suggestions of what people ‘should’ be writing about have no part to play in a socialist attitude to poetry, or art in general. So no one can condemn a collection for failing to open with ‘Haiku on the Tendency of the Rate of Profit to Fall’ and close with ‘Sonnet on the Second Congress of the Communist International’. —but then spirals into an overly long riff on the not very insightful notion that society’s real dividing line is between conventional and unconventional behaviour. Most of these poems have been published elsewhere, and Higgins seems to be deliberately casting his bread upon the waters as widely as possible, to the extent that you could access much of what’s here with a bit of diligent googling. It sometimes means an almost instant response to events, which runs the risk of issuing ill-thought out reactions to developments not properly digested. This is partly why John Lennon’s self-proclaimed habit of making “singles like broad¬sheets” led to some not very good music. But, although his poems show no signs of being revised since first publication, Higgins avoids this for the most part. Now, attempts to spread the socialist gospel are often attended with incidents comic, tragic and pathetic, and an ability to appreciate this in good spirit is as necessary as reading Marx. But this verse leans on a contemptuous stereotype of sections of the working class. Snigger-ing at clothes worn in local authority housing estates, imagining them as giveaways from defunct right-wing tabloids, feeds an attitude which is foreign, not just to the left, but to any honest attempt at expressing reality. Elsewhere things are rightly more complex, however. A former Trotskyist rabble-rouser may well now possess “ideology gone soft as butter” but that doesn’t stop him having to worry about “the fat tens of thousands / you haven’t put by” (‘For Darrell On The Occasion Of His Fiftieth Birthday’). Nostalgia for days of bygone activism features strongly, and possibly the greatest admiration is for a socialist “still sitting in front of armoured cars // others aren’t big enough to resist” (‘Prayer For A Friend’). having gone for a swim. There are poets who take up residence in ivory towers, of course, sometimes permanently, and very occasionally lucratively. But Kevin Higgins is ringing the doorbells of the ivory towers and running away laughing, getting his picture pinned up in the security huts which guard them. He has a rare talent for depicting some of the things wrong with life as we live it, and such a talent can help us in our faltering attempts to change it for the better. Kevin Higgins satirises hypocrisy and, in his fourth collection, The Ghost in the Lobby (Salmon, €12), loves to carve out negative spaces. "That Which Must Not Be Examined" locates the damaged world of "Always the hangover, / never the night before", while "Unbecoming" begins, "All we became / has left the building". In the aftermath of such leave-takings, Higgins generates a world where "They have affairs with dental assistants / in third floor apartments by the docks. / You think of nothing else" (Them and You). Higgins reserves his most hyperbolic satires for armchair conspiracy theorists who "demand the truth / so they can put it in a jar / and spend their whole lives / avoiding it" (Against Togetherness) and those Pollyannaish optimists who think history’s cataclysms have concluded: "The hijackers you envisaged / always landed the plane / and let the passengers go" (Historically Sensible). The casualties of both approaches are evident in The Euphemisms, one of his poems about “Something you can’t have women / walking in off the street /and demanding." Higgins is… a poet who has a vision of Ireland. His is populated by smug, noisy fools and furnished with both trendy white goods and the flotsam of talk radio. Fluent and often as laugh-out-loud funny as Paul Howard's Ross O'Carroll-Kelly, Higgins's poems sometimes make you think that they do not want to escape the terrible, lovingly described cul de sac he has defined so well. no one wants to talk about.